At the back of my latest book, To Begin Again under the information about Nana Sinclair, I promised to add extra information about both the Barnardo Children and my grandmother, Margaret Sinclair’s life as a British Child Immigrant. I have finally begun that process. Today I offer a picture of the ship she sailed on from England, as well as information about that boat, the S.S. Dominion 2. There are links which will lead you to details about travel as a steerage passenger on the ships in 1903. My Grandmother, Margaret (Maggie) Sinclair and other children travelled to Canada on the S.S. Dominion 2. The ship that came to be known as the Dominion (2) was launched in Belfast in 1893 as the Prussia and sailed for the German Hamburg-American line. In 1898, the Prussia was sold to the British Dominion Line and was renamed the SS Dominion (2). At this time she was refitted and reconfigured to provide accommodation for 200 First Class, 170 Second Class and 750 Third Class passengers. This rebuild took only a few months before she was ready to go on the Liverpool – Quebec – Montreal route on the Dominion’s Line’s principle service in May 1898. Other ports of entry included Halifax and Portland, Maine. The Dominion (2) carried 6,876 British Home Children to Canada from various organizations including Barnardo’s, Dr. Stephenson’s National Children Homes, the Fegan Homes, Miss Bilbrough and Rev. Wallace of Marchmont Homes and Mrs. Louisa Birt. There was a steady stream in the numbers of children sailing on board the Dominion with the busiest years being 1903 (786 children), 1905 (562), 1906 (1121), 1907 (905) and 1908 (1130). When the White Star/Dominion joint service to Canada was instituted in 1908, the Dominion (2) was largely unneeded, so from then until 1915, she was periodically chartered to the American Line for service on American’s Liverpool-Philadelphia route. Originally a British company, the White Star Line was absorbed into the International Mercantile Marine Co. (IMM), a large American shipping conglomerate in 1902. The American Line was also part of the IMM. During World War I, the SS Dominion (2) served mainly as a supply vessel although she did carry some troops. 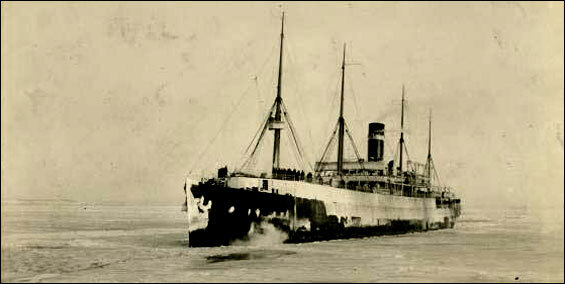 She returned to commercial service in 1918 but was converted to a cargo carrier in 1919. Her final sailing was from Liverpool to Portland, Maine in 1921 before being scrapped in Germany in 1922. Book Launch for “To Begin Again”. at Lindsay Public Library on Kent St. in Lindsay. The evening begins at 7:00 p.m. I will be there to greet you, sign books, answer any questions you may have, and talk a little about the inspiration behind the book. Wednesday evening, June 13th 7:00 p.m.
at Lindsay Public Library, Kent St., Lindsay, Ontario. I’d love to tell you the inspiration behind my story, and all my writing. I’ve learned so much, writing this book. I’d like to share that too. If you have questions about self-publishing, and why I choose that route I’ll do my best to answer them. I look forward to signing a book specially for you or as a gift for your friends. All will be done by 8:30 so you can get home before dark. One More Step and “To Begin Again” is born. At one point my post had a lower discount. That was an error. Please disregard that one. Once the books are delivered to my home, the price will be $20.00.